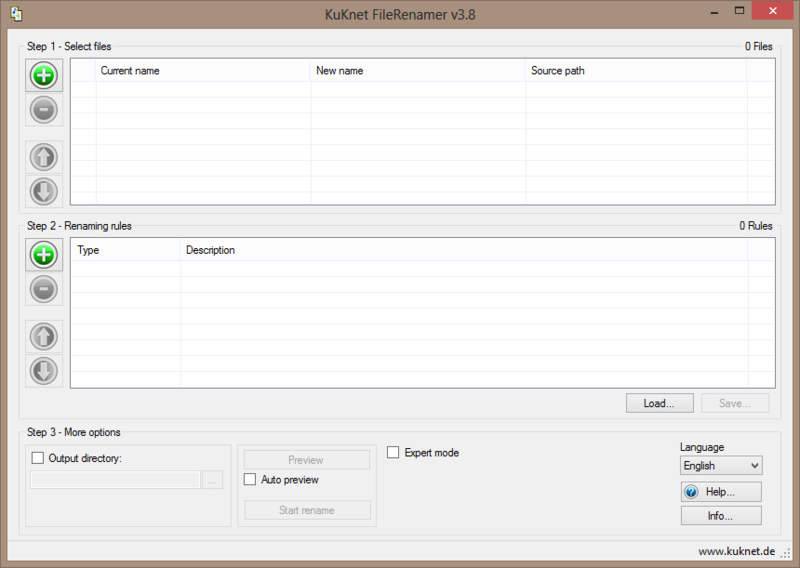 KuKnet FileRenamer is a flexible, powerful and easy to use file renaming tool that supports Unicode, and drag and drop. Available rename instructions can be added, such as replace, insert, delete, change case, change file extension, truncate, numeration, prefix-suffix, regular expressions and more. Files can also be renamed according to metadata, including ID3 tags, EXIF, date-time, file size, hash, etc. Processed files can be copied or moved to a user-specified directory, with access to frequently used rules. The program has a rich context menu with image preview, copy-to-clipboard, sorting, export list and more. How to extract: Download the ZIP package and extract to a folder of your choice. Launch FileRenamer.exe. What's new? See German changelog here. My mistake, it does not need admin privilege to run. GREAT for renaming using regular expression (regex) that contains lookbehind. It also accepts the plus symbol (+) inside lookbehind. Other renamers does not support any of these, not even Advanced Renamer and Bulk Rename Utility. It can apply multiple regex parameter separately for the same batch. Issues are there are no way to apply regex only to file name and not to the extension. It also needs admin privilege to run.